With the possibility of a landfall in Florida, Georgia or the Carolinas Hurricane Irma could also head into the eastern Gulf of Mexico. The exact path of Irma beyond the end of the week remains uncertain but it is important to be prepared for an event of this size. US Flood Control and Tiger Dam™ Systems still has systems available for immediate deployment and can be in place in time to save property and infrastructure. Tiger Dam™ Systems and US Flood Control helping to control flooding in ongoing efforts to hold back flood water in Texas after hurricane Harvey. The Us Flood Control Team has been in Texas for two weeks working with local officials to deploy Tiger Dams™ where they are needed most. Contact us for emergency information and help . We have product ready for immediate delivery!!! WE HAVE MILES OF FLOOD PROTECTION PRODUCTS AVAILABLE RIGHT NOW! Tiger Dams™ are THE most reliable flood protection system on the market, and the FASTEST to install. And this patented system is fully reusable. The Tiger Dam™ system is a water-filled temporary levee system. They are designed to take any shape, and are the only engineered system that can be joined from just a few feet to 100’s of miles long. It is the only flood control system that can be stacked up to 32 ft. high. In all Government and independent engineering tests, when anchored, the Tiger Dams™ have proven to be the most stable product in the flood control business. As such, Tiger Dams™ are used by more Governments and Emergency Managers around the world than all other flood products combined! We have recently been approved by FM Approvals with a Platinum level certification for Flood Abatement. The Testing protocol was written by the Association of Flood Plain Managers and was facilitated by the Corps of Engineers at their testing facility in Vicksburg MS. This is the only facility in the country that is large enough to test up to the scale need to meet the test requirements. Don’t let flooding shut down your facility or property! Call us now for product details and pricing! Public works professionals from around the world gather August 27-30, 2017 at the PWX Orlando Orange County Convention Center. If you you’re looking for outstanding education you can choose from 125 technical & professional meetings where you will get the latest learning models as well as interactive and “live” learning labs. The Expo will showcase the latest products, services and technologies specific to public works. Tiger Dam™ systems will be on hand to provide expert knowledge and answer all your questions on implementation, set-up and training and pricing for their innovative flood control systems. For more about Tiger Dam™ systems visit our applications page or come say hello at booth 360 the PWX Orlando Orange County Convention Center. The City of Delray Beach has requested a demonstration of the Tiger Dams™ Flood Control system, and they have agreed to host any other municipal agencies who would like to take a look as well. I would like to extend this demonstration to you and your team. Tiger Dams™ are FM Approved with a Platinum Certification, tested through by the USACE Vicksburg MS district. We manufacture various sizes of dams, and we work to stock throughout the year. Tiger Dams™ is a buildable barrier system, it connects end to end to make seamless joins, and it is stackable to mitigate varying depths of flood waters. we are excited to answer all your questions and discuss your local flood issues. Nothing beats preparedness and to be prepared you have to do some training. 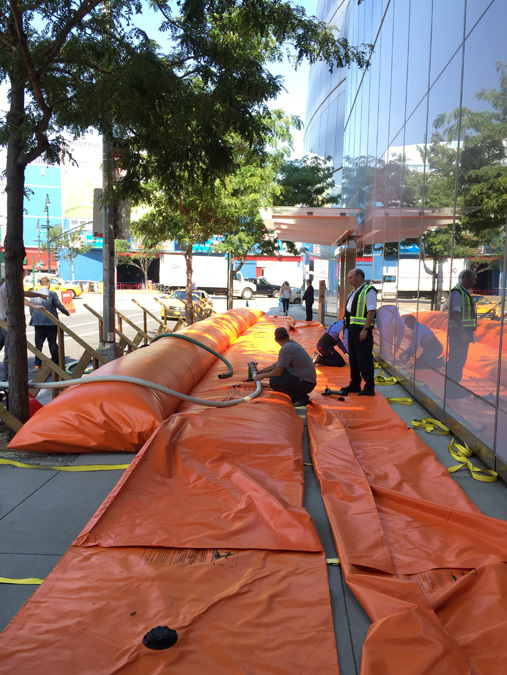 US Flood Control offers extensive training to their clients and their crews on how to manage and deploy their Tiger Dam™ Systems under any conditions and in case of emergency. Their ongoing annual support brings the latest updates to their systems along with field tested knowledge of the dams in practice to their clients. Much like the police or your local fire department repetition is the key that brings success in any emergency situation. Tiger Dam™ is dedicated to this training to guarantee that their systems and their client’s crews can be operational in any flood, water related or bio hazard situation at a moment’s notice. These images from our Us Flood Control training in New York give a great over view of a typical Tiger Dam™ training day. As if fast rising flood waters aren’t enough you might also have to contend with the many different degrees of hazardous waste materials those waters collect along the way as well. Many cities in older areas have combined sewer systems (sewage and storm water). This makes them particularly vulnerable to leaking into the river systems in periods of high water. Depending on proximity, retention ponds and stagnant irrigation ditches can also become part of the mix as river and water levels rise. Tiger Dam™ systems are designed specifically to control these and many other hazardous flood conditions. Tiger Dam™ systems are the ONLY system patented to connect together to create an impervious barrier for miles and at ½ the price of sandbags. Find more of Tiger Dam™ system applications here ». US Flood Control & Tiger Dam™ Systems has been called to flood zones all over the world. Contact US Flood Control today to find out how inflatable dams can prevent flooding. Call (504) 813-7303or email at david@usfloodcontrol.com. With the recent flooding in Kelowna, British Columbia, Tiger Dam Systems™ was called in to help prevent flooding and erosion of the beaches that make the area a tourist hot spot. Clean up crews are now busy in the aftermath of the high water levels and with beautiful weather now expect to see a return of tourism to the pristine sandy beaches and beautiful scenery that make Kelowna a destination point for thousands every year. Call us for more information on how Tiger Dam Systems™ prevent flooding all over the world.